Hotel rooms in the lower grade hotels can sometimes be smaller than their Western equivalents and some may not even have a view or a window, so it is often worth the upgrade. That said, prices for 4 and 5 star hotels here are lower compared to other international cities and service is efficient and attentive. Located in Taipei’s up and coming Da’an district, Les Suites is central located in this trendy neighborhood. Taipei’s Da’an district is located in between trendy Xinyi and gay area of Ximen. Known for its under the radar gay bars and trendy independent shops the Suites Taipei is comfortable, uncluttered and functional. Check for the lowest rate for the Suites Daan and book now. For those preferring to stay close to the gay venues in Ximen, check out the In House Hotel. The 60 room hotel is the creation of nighclub empresario, Ted Su and uses a clubby chic decor. It’s Lounge bar on the ground floor is the popular “Prive” bar. Check for the lowest rate for the InHouse Taipei and book now. Head to the Marco ‘Polo Lounge and sip on one of 101 martini’s as you watch the sun set over Taipei. Definitely the best views of the city and one of the few outdoor pools where you can soak up the sun during the hot Summer months. Check for the lowest rate for the Shangri-La Far Eastern Plaza and book now. The Hotel Eclat is a haven of peace and tranquility but still located in the trendy Da’an district. The three year old Hotel Eclat has one of the most impressive collection of art by Dali and Warhol among others. Room amenities include Nespresso machines, Toto toilets, Molton Brown products and free wi-fi. Check for the lowest rate for the Hotel Eclat Taipei and book now. 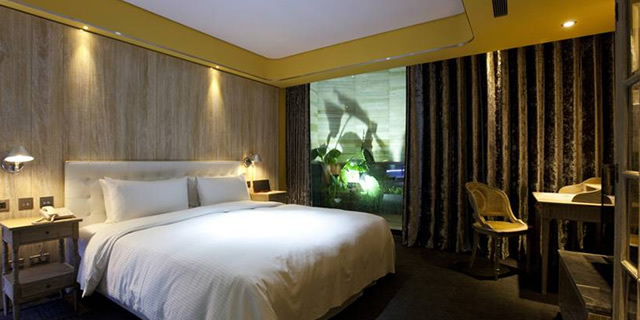 Located in one of Taipei’s most prestigious districts, the W Hotel certainly has the Wow factor. The W Hotel Taipei set the hotel scene on fire when it opened just a few years ago. It has left other 5 star properties in its wake and has some of the finest restaurants in the city. Rooms are large and spacious and the WET bar by the pool is a popular location with local gay boys and their friends. Check for the lowest rate for the W Hotel and book now. Many of the business hotels tend to be quieter during the weekend and so you can get good rates for long weekend stays. Large scale events such as New Years Eve and Pride together with the large circuit parties attract people from all over Asia so its wise to book your hotel well in advance.